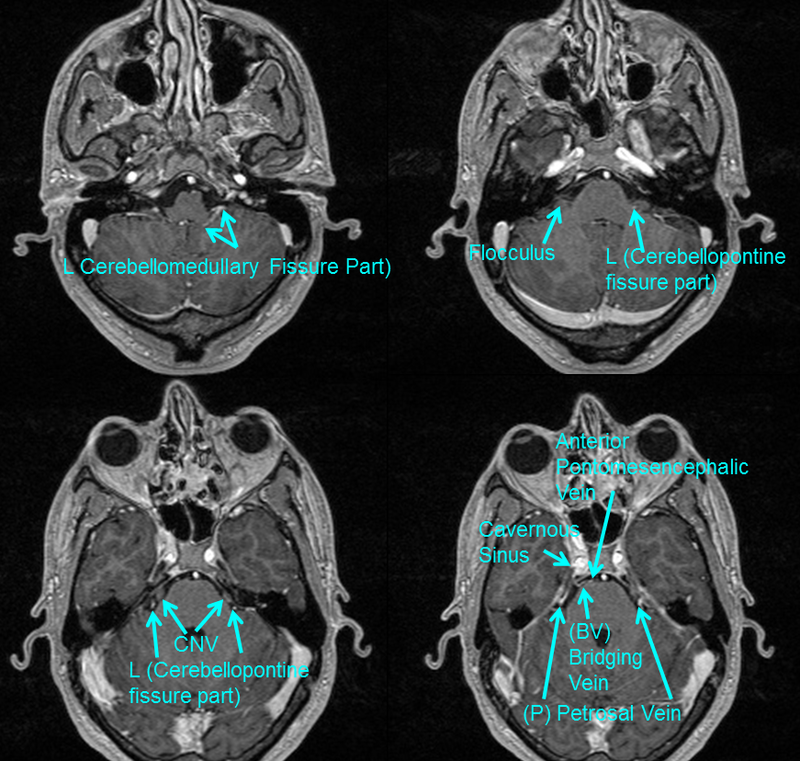 In keeping with the main theme of this work, the key task for the modern neuroangiographer who has come to rely on cross-sectional imaging for brain anatomy, is to know the location of the posterior fossa/ brainstem structures based on angiographic anatomy, particularly venous anatomy. There is so much variability in venous arrangements that, in my opinion, knowing where a given vein is with respect to the brain it drains and how it is related to the overall venous arrangement is more important than nomenclature. 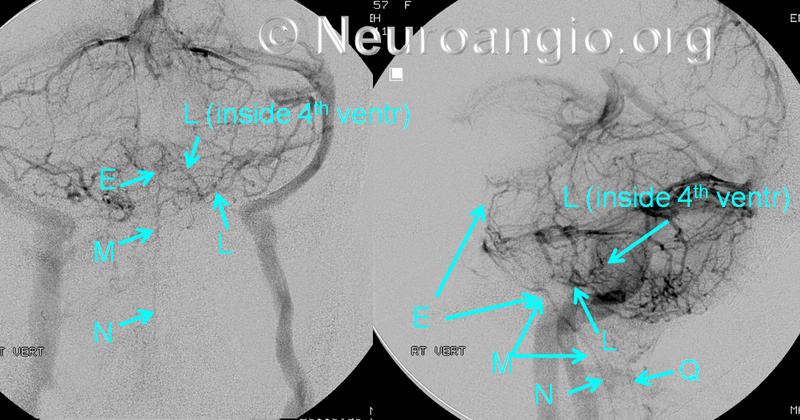 In this regard, the 4th ventricle is one of the key structures which can be located based on venous angiography. 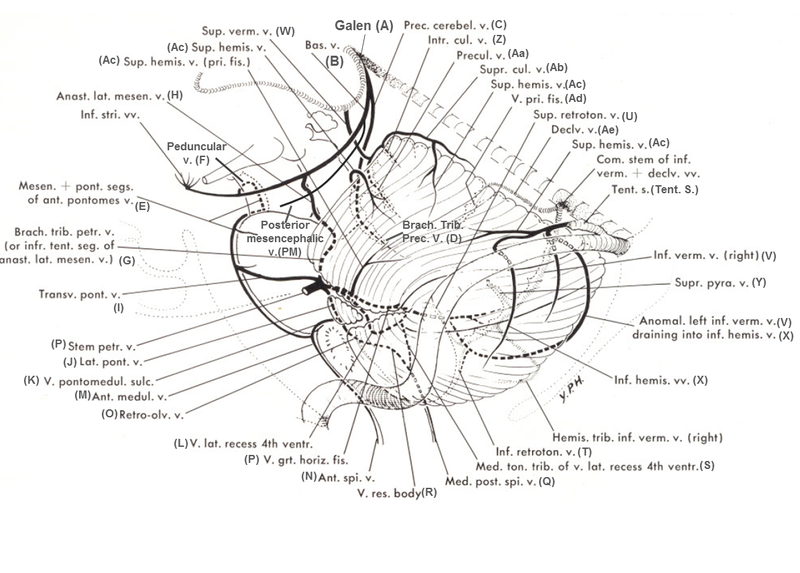 One can use both morphometry (simple measurements), venous landmarks, or both. My general radiology mentor, Dr. Alec Megibow, holds that a radiologist with a ruler is a radiologist in trouble. Although he is certainly right, it’s nevertheless OK to admit trouble and use the ruler. In a typical adult, the 4th ventricle is located more or less behind the pons; its craniocaudal extent corresponds roughly to the vertical length of the pons, which is going to be about 1 good old American inch (2.54 cm) long. Conveniently, the pons is also about 1 inch (2.54 cm) thick (or somewhat less) on a mid-sagittal MRI image; which also proves that the American system is the better one. This is not perfect, for example the interpeduncular vein is somewhat below the inferior margin of the interpeduncular fossa, but that’s a good start. Notice that location of the IVth ventricle can be determined without the need to identify the vein of the Lateral Recess. 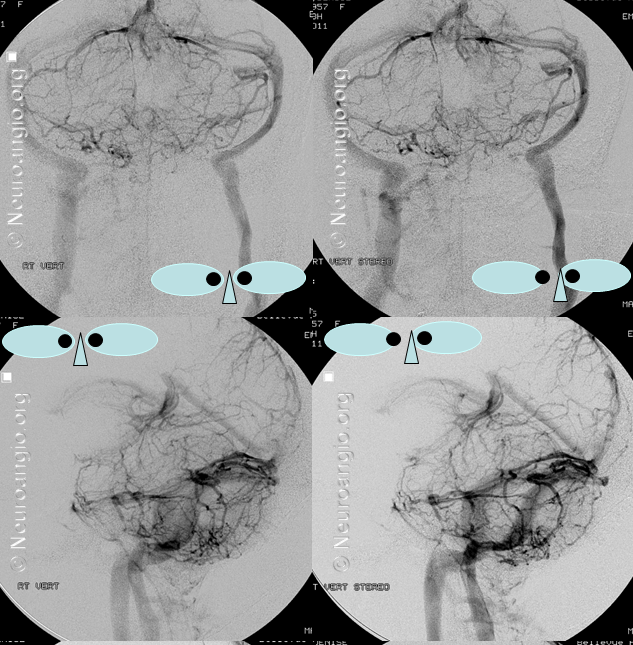 The reason for the prominence of the anterior group is the hypoplasia of the posterior portion of the Posterior Mesencephalic Vein (PM), so instead of draining into the Galen it empties towards the anterior pontomesencephalic (E) system. Also nicely seen is a longitudinal pontine vein (J) and the vein of the pontomedullary sulcus (K). 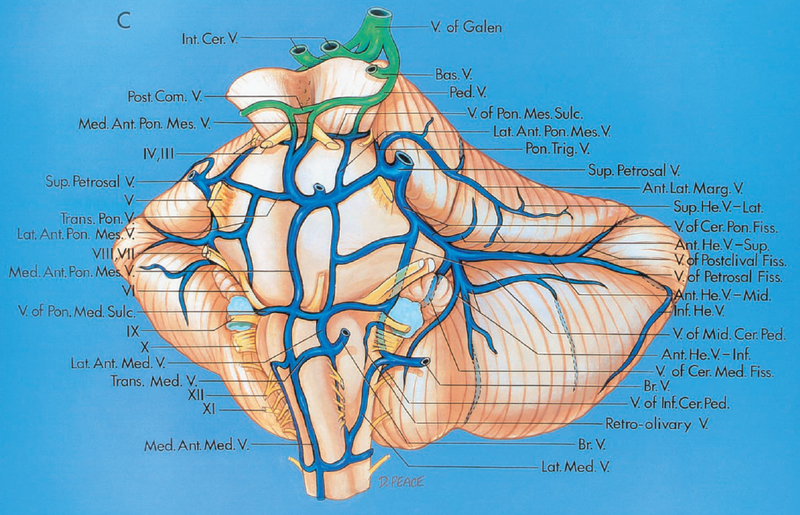 The 4th ventricle will be located behind and slightly below the pons, underneath the Precentral Vein (C), with is caudal margin marked by the Vein of the Lateral Recess of the 4th Ventricle (L), a.k.a. the Vein of the Cerebellomedullary Recess of Rhoton. Also nicely seen are the tectal veins, marking the location of the tectal plate. The same image without any labels, to best appreciate the natural beauty. An image like this one makes things easy, but it is rarely this obvious. 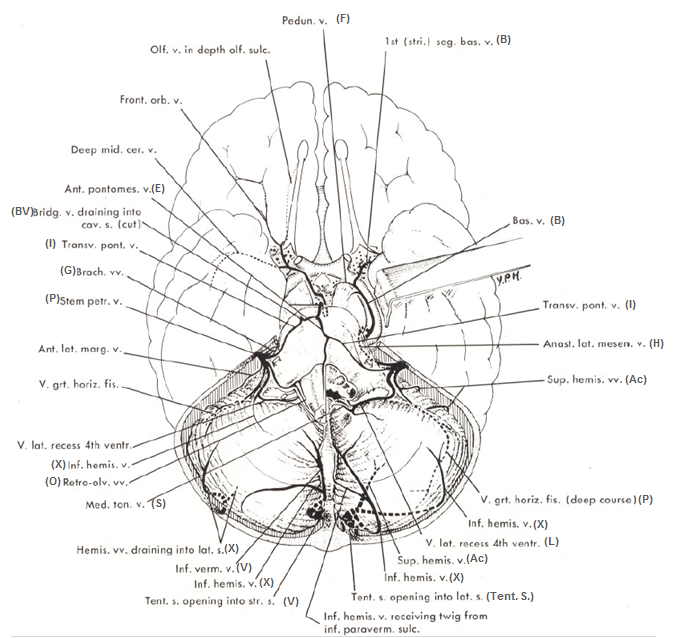 In the neurosurgical literature, as exemplified by Rhoton’s dissections, the same vein is called the Cerebellomedullary Fissure Vein. 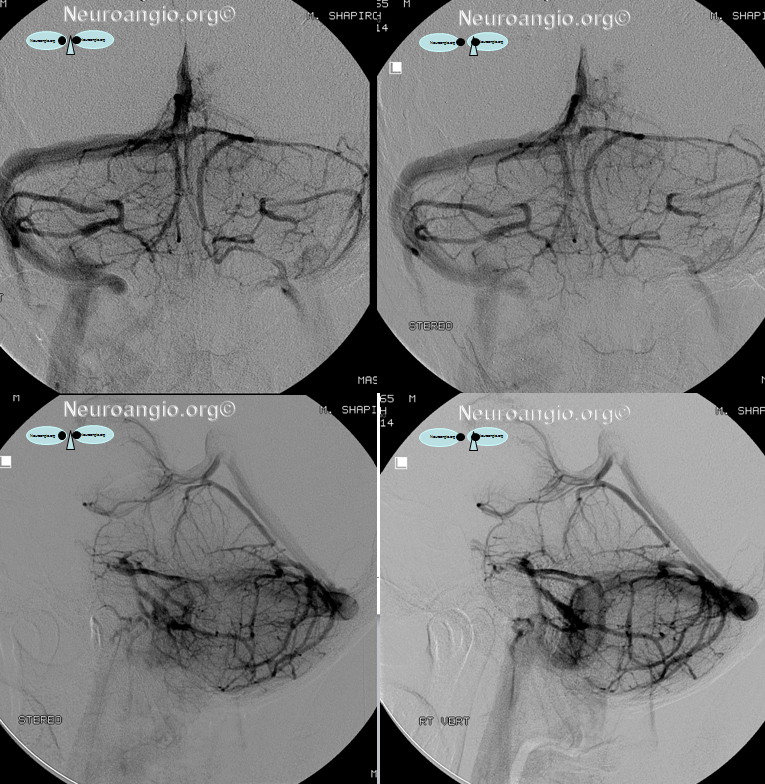 It serves as an angiographic landmark for the cerebellopontine angle. It is a large and relatively consistently seen vein, usually draining into the Petrosal Vein (P). It is usually prominent because it needs to drain the rather vascular 4th ventricle choroid plexus which can sometimes be seen as a blush on an angiogram. In the AP view, the Lateral Recess vein is the one which courses inferior and then medial with respect to the Petrosal vein (P). Keep looking for this vein in venous phases to learn to recognize “mechanically”. Again, the vein has a characteristic hook-like shape on both AP and lateral views. The tip of the hook is in the ventricle and, as it comes through the Lushka it will form the bottom of the hook on both lateral and AP. Convenient. 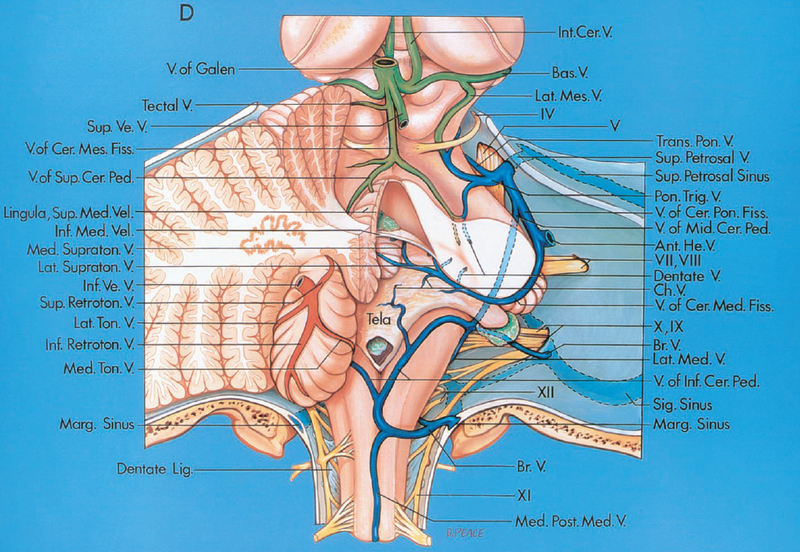 It will then ascend behind the flocculus, within the cerebellopontine fissure, where it is named “Cerebellopontine Fissure Vein” in Rhoton, to join the Petrosal vein (P). 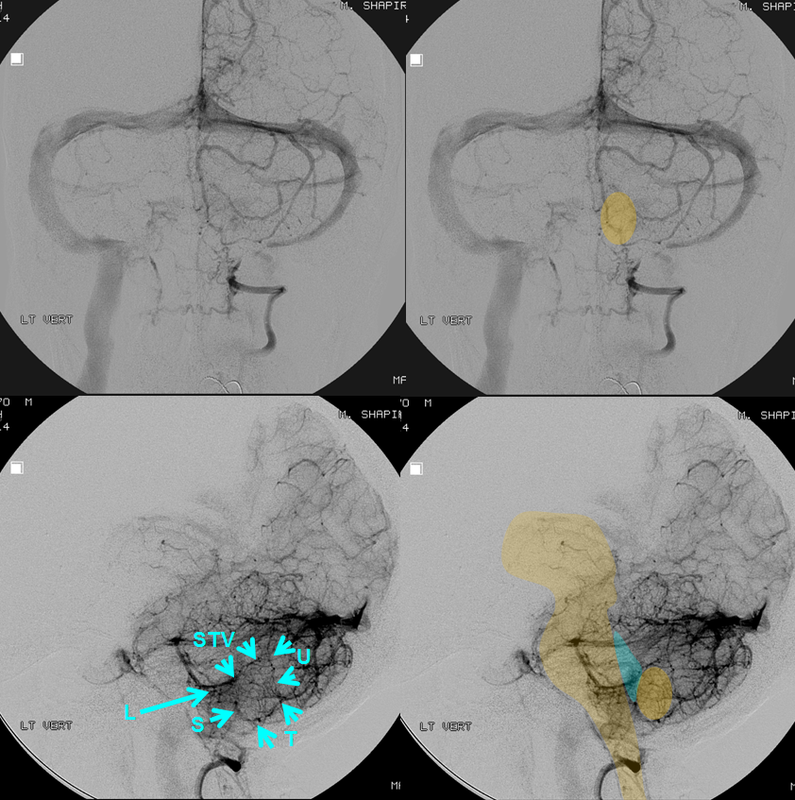 The flocculus separates this vein from the more anteriorly located Lateral Pontine Vein (J), also known as the Vein of the Middle Cerebellar Peduncle in Rhoton. There are of course variations which will be shown. 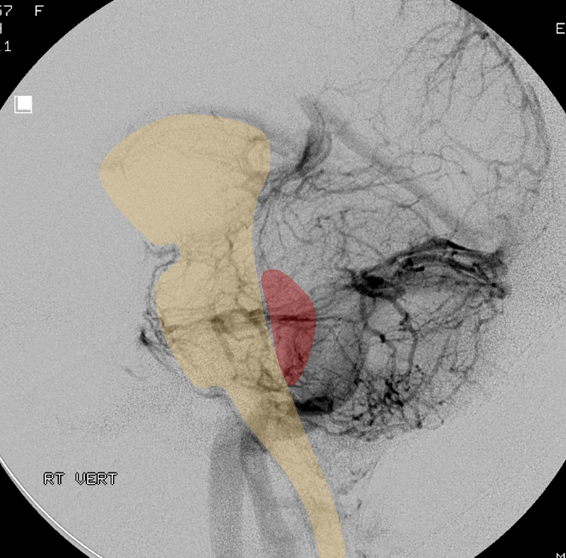 So, the bottom of the hook marks the inferior extent of the 4th on a lateral view. 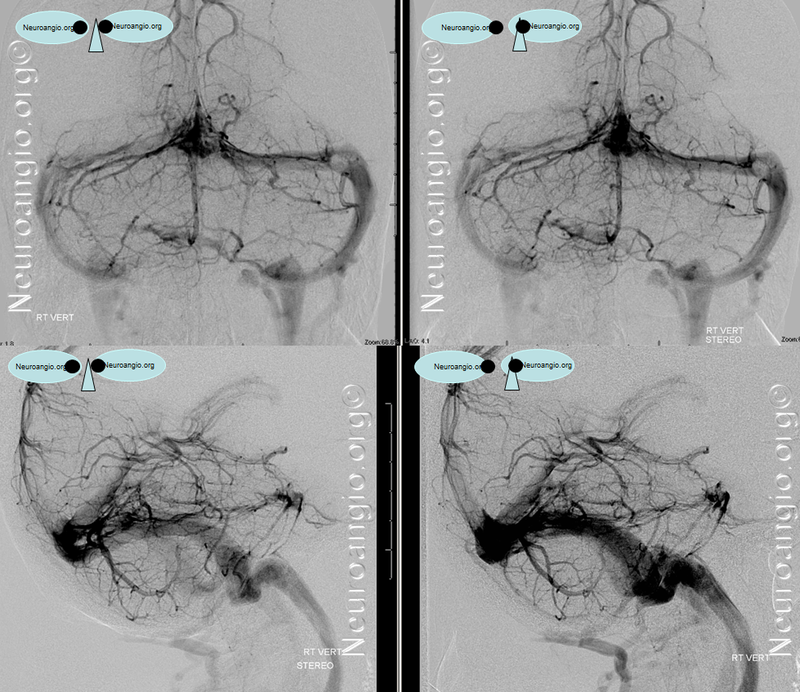 As with any posterior fossa vein, especially for those not yet comfortable with venous angiography, contrast MRI is an excellent way to see all kinds of veins. Any volumetric sequence (MP-RAGE, for example) will do a great job in a cooperative patient. Here, the vein of the lateral recess is marked with a pink arrow. 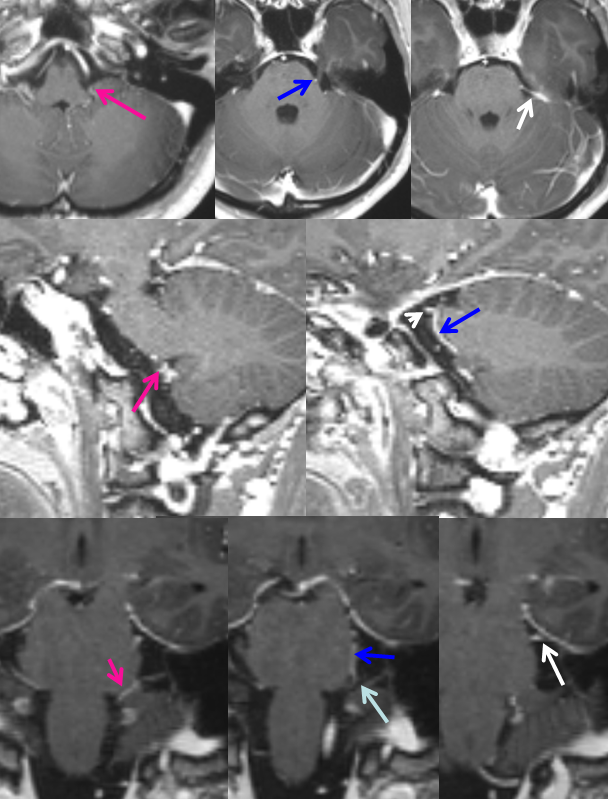 It ascends on the lateral aspect of the pons, here being named teh Pontocerebellar Fissure Vein (Rhoton, blue arrow) to join the petrosal vein (white arrow, P). Notice how the vertical aspect of the lateral recess vein, a.k.a. 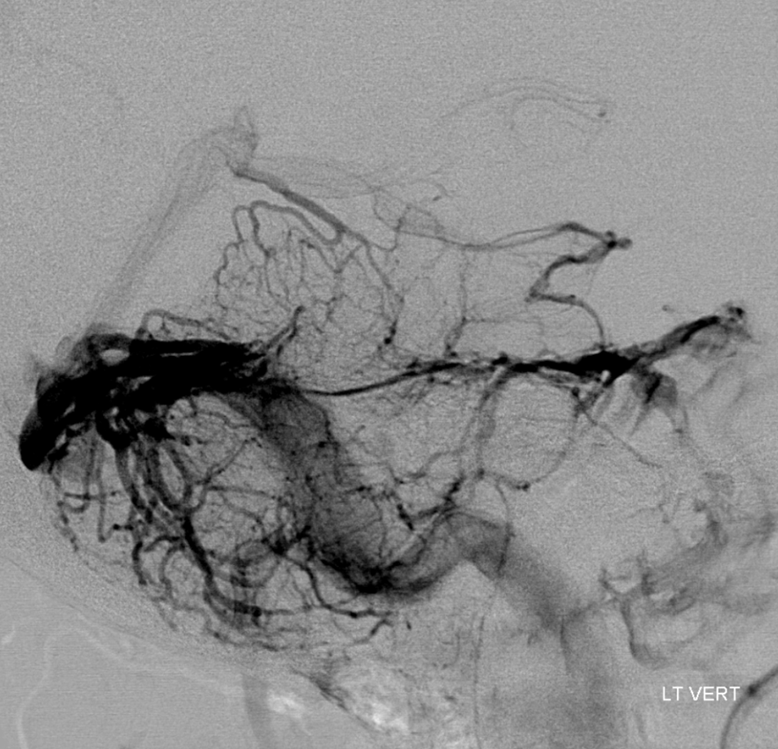 the Pontocerebellar Fissure Vein is intimately related to the trigeminal nerve, usually running on its medial aspect, as in this case. 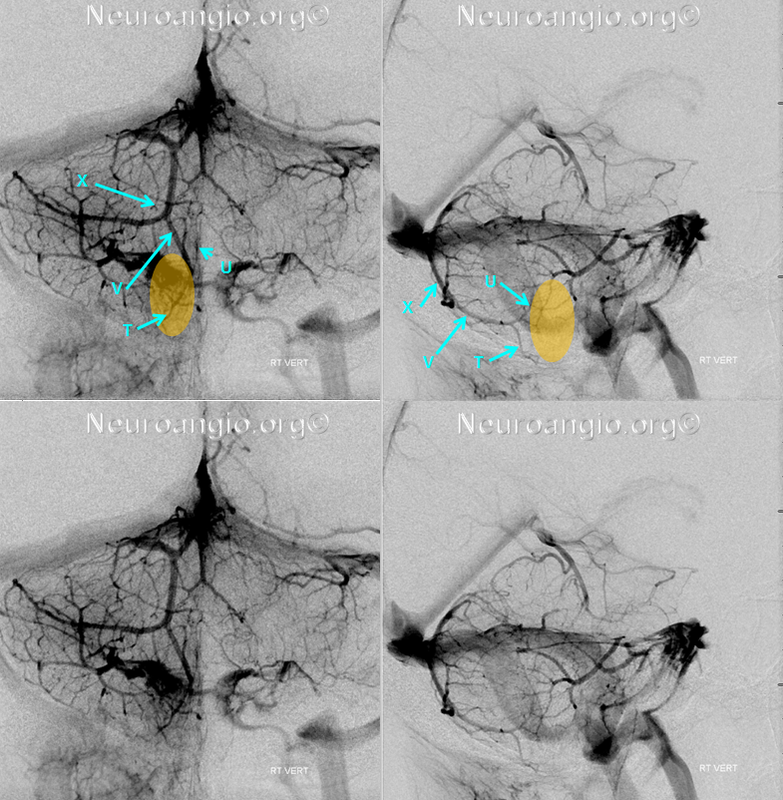 Rhoton, in fact, in the Neurosurgery 2000 supplement manuscript on the retrosigmoid approach describes the phenomenon of venous compression upon the rootlets of the trigeminal nerve — the pontocerebellar fissure vein being one of the culprits. The choroid plexus of the 4th ventricle is, many times, found not only in the 4th ventricle but also outside of it, spilling out from the lateral recess / foramen of Luschka / lateral aperture. 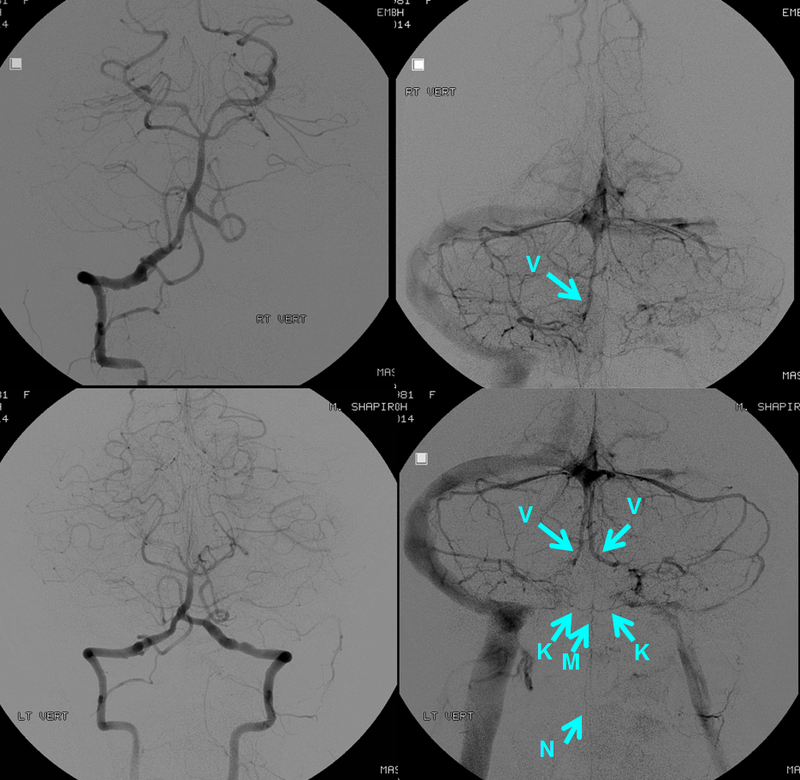 Another MRI example of the lateral recess (L) vein, with its horizontal part (cerebellomedullary fissure vein of Rhoton) emerging from the lateral recess, then ascending on the lateral aspect of the pons as lateral recess (L) vein or, in neurosurgical literature, as vein of the cerebellopontine fissure, in close relationship to the flocculus and CN V, to converge onto the Petrosal vein (P). 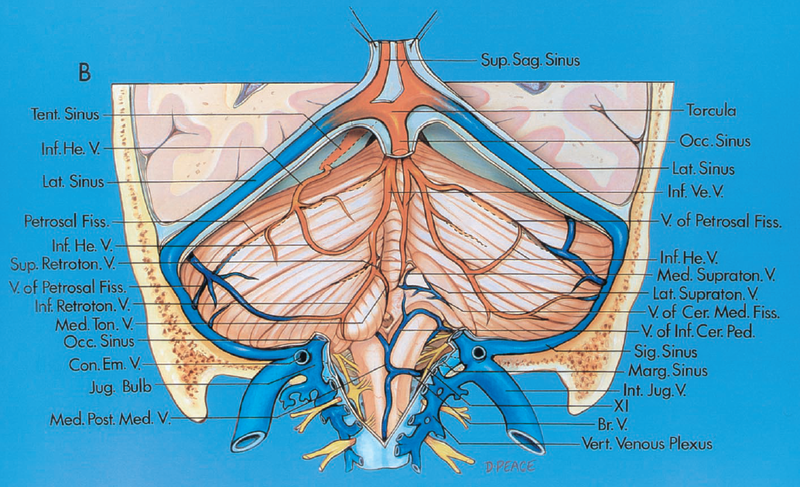 Notice homology of the Petrosal vein draining into the superior petrosal sinus with the Bridging Vein (BV) draining into the cavernous sinus. These veins are, as a rule, below angiogrpaphic resolution. Though they may be occasionally identified on high-field MRI, they remain of primary landmark interest to the rare neurosurgeon still willing to behold them in vivo. The cerebellar tonsil is located lateral and posterior to the 4th ventricle. It is supplied mainly by branches of the inferior vermian vein (V) and the vein of the lateral recess (L) a.k.a. the cerebellomedullary fissure vein. The latter is usually responsible for the anterior portion of the tonsil, while (V) supplies the posterior part. Of course, variability is the rule, and when one is hypoplastic the other will take over the job. The sum total of the story, in my opinion, is that tonsillar veins are variable and their nomenclature is confusing. Moreover, the veins are so variable that assigning a specific name to this or that tonsillar vein may not be helpful or accurate. The most important point, again, is to know where the vein is in relation to the brain, or the tonsil part of it in this case. In this example, the lateral recess vein on the left receives the medial inferior tonsillar vein (S) and the anterior superior tonsillar vein (STV). The way to identify (S) is to look for a vein which courses inferiorly from the medial horizontal aspect of the lateral recess vein (the cerebellomedullary fissure vein). On the right, the inferior vermian vein is prominent, and receives (S) instead. The cerebellar tonsil position can be usually determined based on location of the superior (U) and inferior (T) retrotonsillar veins, which together with the inferior vermian vein (V) look like a claw in the lateral view, as in the following example. I think that this “claw” is the most consistent venous part of this whole tonsillar business. The point, again, is to recognize from the venogram where the tonsil is. In conclusion, remember that the choroid plexus is a relatively vascular structure, and thus the vein of the lateral recess (L), a.k.a. the cerebellomedullary fissure vein will be present in nearly every case. Look for it as a way to define the inferior border of the 4th ventricle in both AP and lateral views. It is important to remember the basic rule that, in angiography, veins are only visible when the arterial territory which they drain is injected. In the posterior fossa, this is most important for the PICA territory, which is not always sufficiently seen from the contralateral vertebral injection. Even when enough contrast can be retrogradely forced into the contralateral PICA to sufficiently evaluate the arterial anatomy, the same contrast volume may not be adequate to see the veins. Remember that 75% of total blood volume is in veins at any given time. 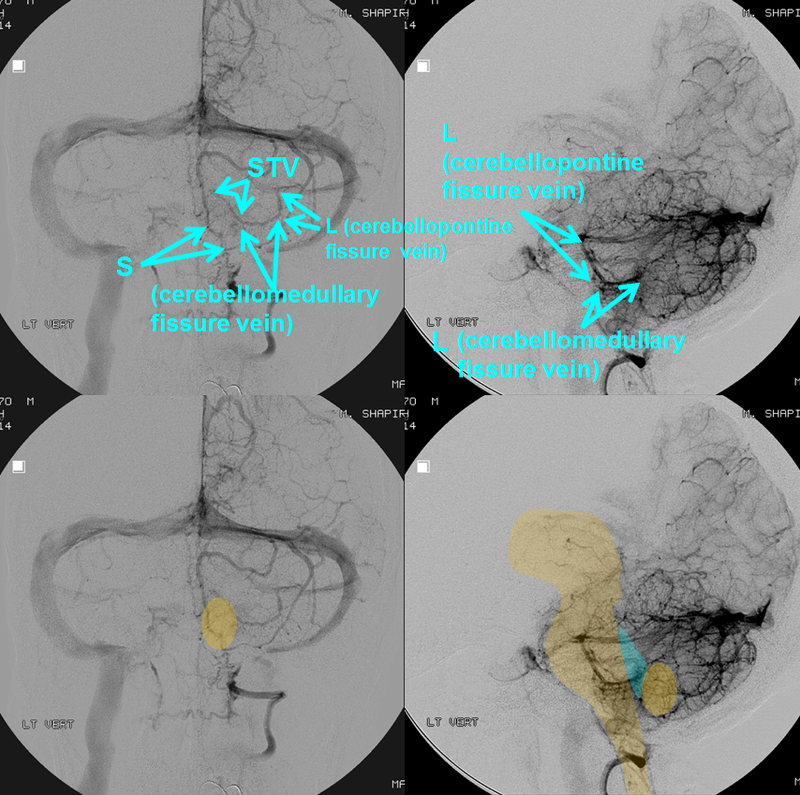 Since the PICA usually supplies the inferior cerebellum, the venous complex corresponding to the PICA is the inferior vermian veins, tonsillar veins, anterior cerebellar veins, and some medullary veins. Remember rule #1 — if you don’t see a vein, it doesn’t mean that its not there, if the same vein could be draining the territory of an artery which was not injected to produce the picture you are looking at. Inferior vermian veins are a good example of this: only the left one may be seen from left vert injection, and the right one might be there, if you had injected the right vert. 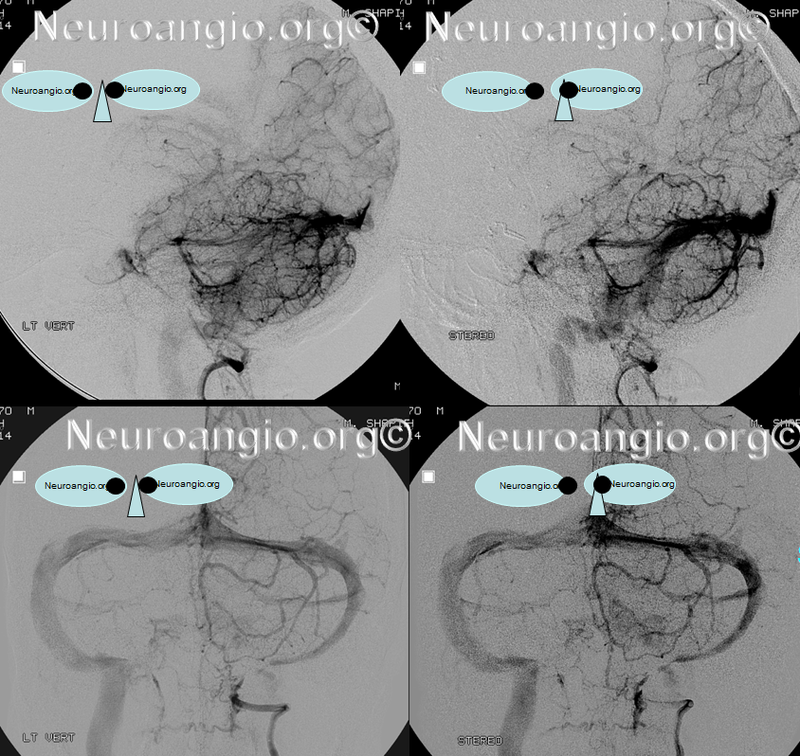 All sorts of fakeouts are possible with in-vivo angiography, depending on the arterial arrangement.